Week 1 had more marquee matchups than any opening week of college football ever. Week 2 was a joke on paper, but as usual in this sport, the cupcake games showed the true colors of the teams we weren’t really sure about. It also generated some truly amazing individual achievements from players, as well as muddied the water around the College Football Playoff picture. Check out my recap of week 2 below, as well as my bowl projections, Heisman watch, and which games to look forward to next week. 25 (NR). Oregon (2-0) – The scores of their first two games have not been attractive, but the stats have been lopsided. The pieces are there, they just aren’t polished just yet. 24 (NR). Iowa (2-0) – The Hawkeyes did what so many Hawkeye teams haven’t been able to do in the past: put away archrival Iowa State. 23 (25). Nebraska (2-0) – They have had two lopsided wins against typically good Group of 5 schools. 22 (NR). San Diego State (2-0) – The longest win streak in America (other than Bama) continued with a win over California. 21 (22). Notre Dame (1-1) – The Irish have found their answer at quarterback. The loss to Texas stung, but they rebounded and took out Nevada in style. 20 (11). Georgia (2-0) – The Bulldogs narrowly escaped against pathetic FCS Nicholls State a week after winning an overrated game against North Carolina. They need to figure out their QB situation (play Jacob Eason all game) and just take this year as a learning experience. They are not good enough to compete in 2016. 19 (21). South Florida (2-0) – USF is a scary Group of 5 squad. They annihilated traditional MAC power Northern Illinois in Week 2. 18 (24). Utah (2-0) – The Utes took down BYU in the Holy War. It was an incredible game, and even though turnovers might be an issue for the team moving forward, they had one of the most impressive week 2 wins. 17 (20). Pittsburgh (2-0) – The Panthers have their best team in several years. They took down former archrival Penn State in a wild game that no one could have predicted would be a shootout. 16 (15). LSU (1-1) – The Tigers had Jacksonville State head to Death Valley after their ugly loss to Wisconsin, and they looked sluggish offensively once again. They absolutely need to solve that if they want to have a chance to have a successful season in SEC play. 15 (19). Oklahoma (1-1) – The Sooners rebounded well against ULM, a team that has traditionally given trouble to teams overlooking them. 14 (13). Baylor (2-0) – The Bears had a slow start before taking over against in-state foe SMU. 13 (17). Boise State (2-0) – The Broncos beat an incredible road team on the blue turf when they took down Washington State. They look balanced and like a really scary Group of 5 team. 12 (12). Stanford (1-0) – They beat K-State in week 1 before having a bye. They are going to be totally solid as long as they keep feeding the best player in the sport Christian McCaffrey. 11 (8). Clemson (2-0) – All 2-0s are not created equal. Clemson looked lousy against Troy after looking lousy against a terrible Auburn team. They still have the offensive talent to remain cautiously optimistic, but this doesn’t look like a contender right now. 10 (10). Texas A&M (2-0) – The Aggies followed up beating UCLA with a complete joke of a game, winning 67-0 against Prairie View. 9 (9). Texas (2-0) – The Longhorns appear to have found their future at quarterback. I’m hesitant to say that they are back, but they are absolutely the most improved team in the nation. 8 (14). Louisville (2-0) – I was wrong about this team. They are absolutely electric, and after winning huge in a building that has given several ranked teams trouble in the recent past, they are officially a real threat in the ACC. 7 (7). Wisconsin (2-0) – Wisconsin followed up their big win over LSU with an offensive explosion. 6 (4). Ohio State (2-0) – Their final scores aren’t indicative of how the Buckeyes played. JT Barrett has started incredibly slow in both weeks so far. 5 (5). Washington (2-0) – They have two straight efficient and dominating blowout wins. The defense is good enough to carry the team to the playoffs. 4 (6). Michigan (2-0) – It is difficult to not be completely impressed with Michigan, who have simply hammered and demoralized two straight opponents. 3 (3). Houston (2-0) – It was a difficult day for Houston after playing almost an entire quarter before having a nearly 4 hour weather delay, but that didn’t prevent Houston from holding Lamar to less than 100 yards and 0 points. 2 (2). Florida State (2-0) – Following their big comeback against Ole Miss, FSU wasted no time putting away a great FCS team in Charleston Southern. 1 (1). 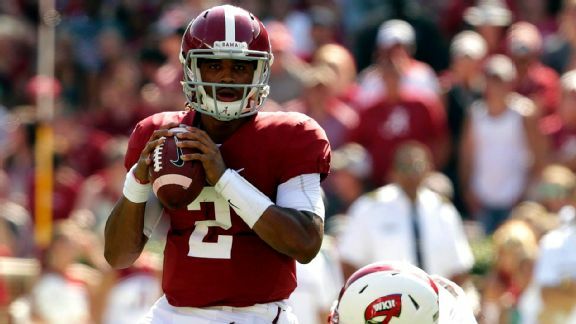 Alabama (2-0) – The Crimson Tide struggled for all of about 5 minutes against Western Kentucky before completely taking over and cementing their spot as the #1 team through 2 weeks. 5. USC at Stanford (#12), 5:00PM ABC – This is always one of the most interesting games in Pac-12 play. Stanford had a week off, but they didn’t exactly look like world beaters in week one. USC took out their Bama frustration on Utah State. Stanford’s home field advantage is pedestrian. Upset? 4. Oregon (#25) at Nebraska (#23), 12:30PM ABC – Neither team is at the top of their game, but the matchup is absolutely compelling. Can Oregon win the type of game that they consistently lost a year ago? Can Nebraska actually win a big game in the non-conference? 3. Alabama (#1) at Mississippi, 12:30PM CBS – The only team to beat Alabama in the regular season the last two years gets a home game against maybe the most obvious #1 team in the nation since…last year’s preseason Ohio State. If any team has a reasonable chance to beat Bama in the lousy SEC, it is Ole Miss. 2. 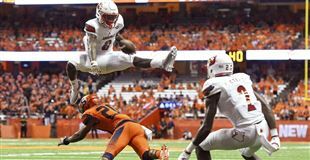 Florida State (#2) at Louisville (#8), 9:00AM ABC – The best matchup in terms of rankings is the game that Gameday will be attending. I am not completely sold on Louisville’s chances to actually beat FSU, but Lamar Jackson against that defense is tasty. 1. Ohio State (#6) at Oklahoma (#15), 4:30PM FOX – The biggest game of the year was maybe the most anticipated game of the year…until Oklahoma got upended in week one. This is still the most interesting matchup. Can Ohio State withstand another slow start against a really powerful offense? We shall find out. 5. Seth Russell, QB, Baylor – He is going to put up monstrous numbers in that offense that doesn’t show any sign of slowing up without Art Briles. 4. Greg Ward Jr, QB, Houston – He may have sat out week two with an “injury”, but the guy is perfect for the Tom Herman offense and will be in the discussion as long as they remain unbeaten. 3. Christian McCaffrey, RB, Stanford – He has only one week, but he absolutely looked the part of a Heisman contender in that week. His stats aren’t even as good as he played. He had a long punt return TD called back. 2. Deondre Francois, QB, Florida State – He has burst onto the scene as quickly as any new player in the nation. He has grasped the offense as well as Jameis Winston, but he also has wheels. He is a terrifying player in the ACC. 1. Lamar Jackson, QB, Louisville – His stats are absolutely absurd. I don’t care about preseason favorites. Jackson is the obvious frontrunner after 2 weeks. Who are your top teams after the first couple weeks? Who is your Heisman favorite? What the hell happened to Northwestern?! Comment below. Bannerizer made it easy for you to promote ClickBank products by banners, simply visit Bannerizer, and get the banner codes for your selected ClickBank products or use the Universal ClickBank Banner Rotator Tool to promote all of the ClickBank products.